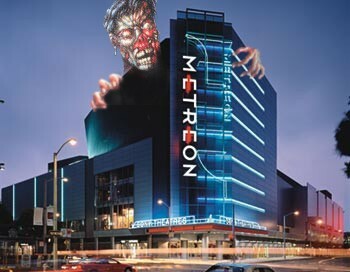 Held on April 2nd, 2004 at the Sony Metreon in San Francisco, California, the Outbreak Release Party celebrated the release of the game in the United States. Apart from showcasing the game, many prizes were given away and people dressed up entertained the crowds. Below you will find various write ups, pictures, and movies from the event. Enjoy. 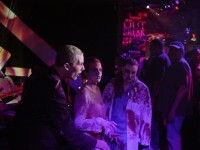 Mike contacted us @ ResidentEvilFan.com to post a more complete version of the events as he stayed for the whole show. He has also provided us a selection of photos from the event and provided several movies that you can see below. Jill explores Racoon City, then gets ticked off seeing someone use a strategy guide! One of the friendly greeters there to "motivate" the guests. A brief tour of the facilities and staff therein. After the fire alarm, it began to show that a few of the enthusiastic fans were a bit... too enthusiastic. The latest in Covert Umbrella Trickery. The T-virus samples are removable. 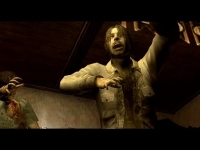 The zombie featured here must belong to the camp who keeps complaining about the controls. After a few moments he gets tired and decides to pursue something juicier. The first set of impressions were originally presented by CVXFREAK who arrived early and left early. It's a quick overview of the event plus his own impressions.